In an unexpected twist, Volkswagen recently unveiled a two-wheeled electric bicycle at this year’s Auto China Show. 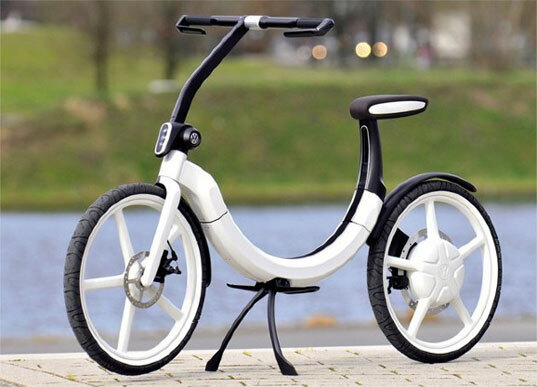 Dubbed the bik.e (yes, that’s how it’s spelled), the sleek portable cycle is capable of folding down to the size of a spare tire and has range of 12.5 miles and a top speed of 12.5 mph (the fastest speed allowed by electric vehicles for passengers to go without helmets in Germany). Volkswagen has announced plans to actually roll out the bike as a “mobility enhancer” option on their autos, as the bike can be replenished by a vehicle’s DC current. @The bystander,I agree that its a great idea to include a crank like traditional peddles to charge the batteries,and maybe use M2E technology too.otherwise it is a lovely way to get the wife in shape!lol!! In an unexpected twist, Volkswagen recently unveiled a two-wheeled electric bicycle at this year's Auto China Show. Dubbed the bik.e (yes, that's how it's spelled), the sleek portable cycle is capable of folding down to the size of a spare tire and has range of 12.5 miles and a top speed of 12.5 mph (the fastest speed allowed by electric vehicles for passengers to go without helmets in Germany). Volkswagen has announced plans to actually roll out the bike as a "mobility enhancer" option on their autos, as the bike can be replenished by a vehicle's DC current.